Easy and Quick Fried Rice. Transform your Leftovers! As regular readers know, I hate wasting any kind of food. After serving up some smashing tacos for dinner this week I had some kaffir lime infused rice leftover, not wanting to toss it, I popped it in the fridge to make something for lunch with it the next day. Gathering bits and pieces from the fridge that wouldn’t be missed I tossed together a quick and easy Fried Rice that only took ten minutes tops. 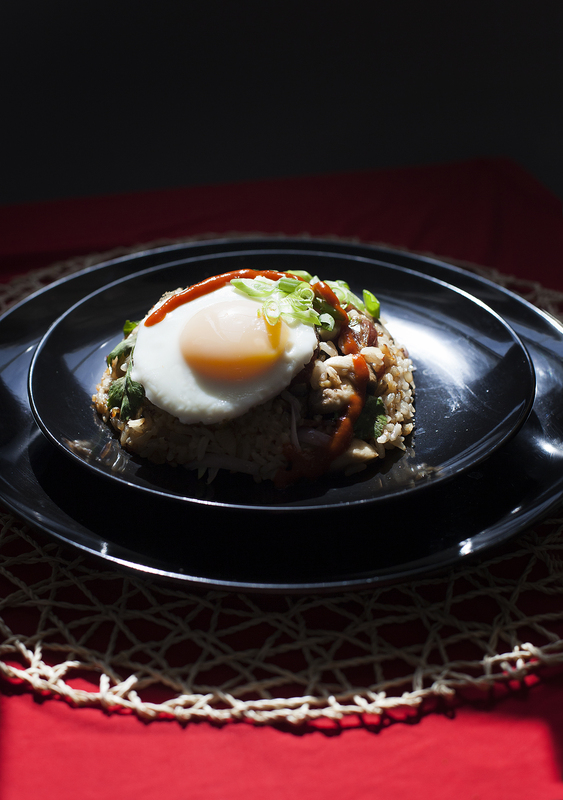 The beauty of Fried Rice is it’s like Bubble and Squeak, you really can throw anything in. You can use any vegetables (or not), just make sure you cut them small so they cook quickly. You don’t need the Shaoxing/Chinese Rice wine if you don’t have it, it’s delicate flavour just adds to the overall taste. It’s always in my cupboard because of a few staple meals I make call for it. However, it is really cheap $2-$3 L and lasts for ages. You’ll find it in the International Foods Aisle or your local Asian Grocer will have it. 1 Cup Boiled Rice, I infused mine with a few crushed Kaffir Lime leaves. (this was done the night before for dinner so was dried out, if you’re cooking fresh boil the rice as you normally would, spread it out on a plate and whack in the freezer to help reduce the stickiness of it. A plate not bowl is preferable due to the larger surface area). Squeeze of Sriracha or your favourite Hot Sauce. Heat a little of the oil in your fry pan or wok. Once the oil starts heating lift your pan from the elements and swirl it a little to get an even coating. Crack your Egg and cover with a lid or even Pizza tray to ensure the yolk area sets nicely. While the egg is cooking, prep the vegies etc. Once the yolk is milky and the whites set, remove egg from the pan and place on some paper towel whilst you cook the rest. Add the rest of the vegetable oil and saute the Onion, Ginger, Chilli and Garlic until aromatic. Cook your Chinese Sausage or Protein, once sealed or heated through add the Mushrooms and Shallot, cook for a few minutes until soft. Add the rice and thoroughly mix the ingredients, toss the pan a little to help coat the rice with all the flavours. Add the Shaoxing/Chinese rice wine and splash of Tamari. Cook for a further two minutes. Remove from heat, toss in the herbs and plate up. Top the rice with your fried egg and eschollot and squirt on the Sriracha or your favourite hot sauce. Handy Hint: To make a little dome shape with your rice, get a small cereal bowl or similar, pack the rice into it firmly, get your serving plate, turn the plate upside down so the eating side of the plate meets the rim of the bowl. Centre the Bowl and quickly invert. Remove gently and you have a little rice hill. It’s not a just Stew. It’s so much more than that. I wrote this whole friggen introduction and then thought; words are not enough. You need to make this yourself to see how unbelievably good this recipe from Bon Appetit is. I hid in another room whilst cooking the stew, as it was  making my tummy hungry. I don’t even think the picture tells the thousand words on this one. A unanimous group decision on the 3 Munches rating! Cut the beef into giant stewing chunks, I actually did a little variation on sizes to help with the stew sauce breakdown and to give different textures if you will. Heat oil in fry pan and seal beef chunks in batches. Be careful not to overcrowd your pan, this way you won’t stew the meat. After each batch, pop the beef into a bowl and set aside. Whilst browning off the meat, prepare the ingredients for the Stew Paste. Toss them all in the blender and whizz until paste like. If you’re have issues with texture not being fine enough, I added a tablespoon of vegie oil to help lubricate the blades, try this to see if it helps you too. Heat a little oil in a large heavy based stockpot or french oven if you have one. Saute the paste for a few minutes until it softens. If the paste is sticking too much just de-glaze the pot with a little water and use your wooden spoon to shift the caramelised paste. Add the Soy Sauce, Star Anise, Cinnamon, Sugar, Fish Sauce and Beef (and juices from bowl). Stir ’till well combined and then add ten cups of water. Note to help the flavours along, I put some of the water in the blender, whizzed, to help clean it and collect the debris from the paste and popped this into the mix. Bring Stew to the boil, then reduce the heat to a gentle simmer and cook for three hours, slightly uncovered or until meat is tender. Pop in the carrots and shallots, for a further 30 minutes or until tender. When the Vegetables go in, pop your noodles on to cook as per packet instructions. Whilst the Noodles are cooking, heat a small frypan on medium (no oil) and toss in the Coconut. Gently toast until they are a lovely tan colour. Remove from the heat and set aside. A few minutes prior to serving, pop the eschalots into the stew and allow them to wilt. Meanwhile, divide your cooked noodles amongst four bowls. Ladle over the stew and garnish with the coconut and thinly sliced eschalots. Serve with wedges of lime. The lads even went back uninvited for seconds! Recipe is as I mentioned earlier from Bon Appetit and they have a great Instagram account that is worth following. A divine recipe with complex layers of flavours that slowly reveal themselves like a gorgeous perfume. 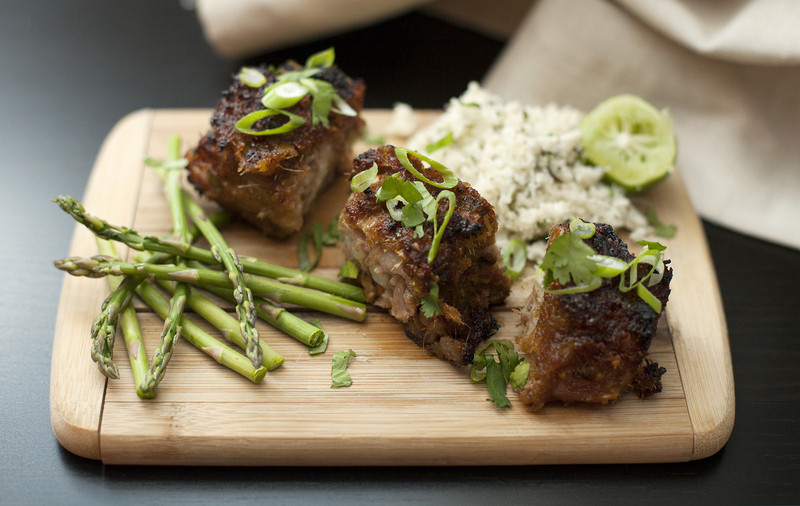 The bite of the lemongrass with the grease of the pork compliment each other beautifully. I used my oven, however the original recipe was written for a Slow Cooker, so you could do this before work, set the device to low and come home to dinner that’s practically made itself. Serves 2 (for four people only double the Ribs quantity). Preheat oven to 85 degrees C or if you oven doesn’t go this low, set the lowest temperature (185 degrees F). Prepare all sauce ingredients and toss into a Blender or Food Processor and whizz until smooth. My blender actually couldn’t handle the work. I was able to get this lot to look like a fabulous laksa paste consistency only, it worked a treat. So don’t despair if you can’t get it runny as. In a bowl toss ribs with sauce to coat well. Place in the baking try and cover with foil. Braise for 7.5 hours. Remove Ribs from oven and line up with space between on a baking paper lined tray, reserving the sauce. Heat Oven to 230 degrees C (450 degrees F). Pour sauce into a saucepan, add the honey and cook until reduced behalf and sauce is super thick. 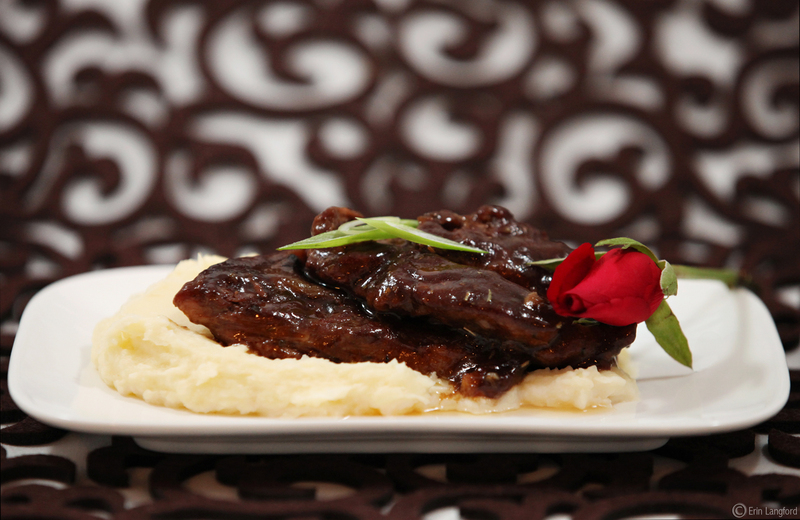 Baste Ribs with thickened sauce and bake for approximately ten minutes or until golden brown. Remove from oven and cut into portion sized pieces. Plate up with your favourite vegetables or salad. Or alternatively do what I did, and make a cauliflower rice (super healthy, light and low calorie). Season the grated cauliflower. Heat frypan to a medium temperature and squeeze lime juice into a pan. Add the cauliflower and cook until tender. Set aside. In a bowl, cover the asparagus with boiling water and cook for a minute or so until they turn a luscious green colour (may take longer if you have thick asparagus). Don’t overcook or they’ll become limp not crunchy. Drain and dry with paper towel. Arrange on a plate with your ribs and enjoy. * Note I have amended a few things just because those easy replacements were already in my cupboard. Enchiladas Suizas. Yep, I went Full Retard. For Christmas last year I received a ginormous Mexican cook book from my partner’s brother, Mick who happens to be a Chef and knows I am recipe reading loving nut. The book, Mexico The Cookbook is published by Phaidon so I knew I was in for a treat. I saved my first cooking experience for when I arrived in Los Angeles so I could recreate the recipes with access to real deal ingredients. I went Full Retard on this one, making my own Tortillas too, something I won’t do again because it just added that much too much more time to what is essentially an easier style meal. Though they tasted just like the real things (small victory) they’re just simply so cheap here I’ll buy pre-made ones in the future unless a dear friend requests otherwise. Daunting the recipes read with unfamiliar herbs, fruit (I think) and flavours I put faith in a) my common sense and b) the recipes. Not the prettiest recipe on the blog, but she packs a flavour punch! First we make the Tortillas. Or you can Skip this part and head straight to Enchiladas I won’t judge. Combine Masa Harina, Salt and the water. Add the water only one cup or 1/2 cup at a time. I did this because the original only states one, which didn’t result in a pliable dough. So add your water until you get a moist dough that you can roll with your hands but not sticky. Shape balls into a golf ball size and than roll out between two sheets of baking paper using a giant salt canister…Just kidding. Use a rolling pin, the salt canister is what I resorted to as I am staying in a bachelor pad with not a pin in sight, nor a Tortilla Press as the original recipe suggest pulling out of your cupboard. Roll in a round tortilla until super thin and about 12 cm across. Once rolled stack them between Paper towel until complete. Heat a pan, with no oil and cook the tortillas one at a time for a few minutes until they are more white looking than dough, like when you buy them in the packets. Set aside. 4 Cups of Shredded Cooked Chicken, I used a 1/2 BBQ chook from the grocery store, and use the other half to make Pho. 150 g Swiss Cheese, grated. Preheat Oven to 400 Degrees F or 200 Degrees C.
Grease a baking dish with the butter and set aside. Put the Tomatillos, onion, garlic and chillies in a pot and add enough water to just cover everything. Bring to the boil with lid on, then reduce to a simmer for 30 minutes. Transfer to a Blender then whizz ’til smooth. Whilst the tomatillo mix is cooking heat the oil in the fry pan and cook your tortillas one at a time for about ten seconds only, remove and drain on the paper towel you have already from earlier. Or get fresh paper if your using pre-made tortillas. Fill the tortillas with the shredded chicken, roll firmly and place in the baking dish. Once you have rolled out all of your tortillas, place the blended tomatillo mix and sour cream back in the pot and gently simmer for 3 minutes until well combined. Pour this over your enchiladas until covered. Sprinkle with the cheese and bake until cheese has melted for approximately ten minutes. Keep any eye on it though so it doesn’t colour and burn. 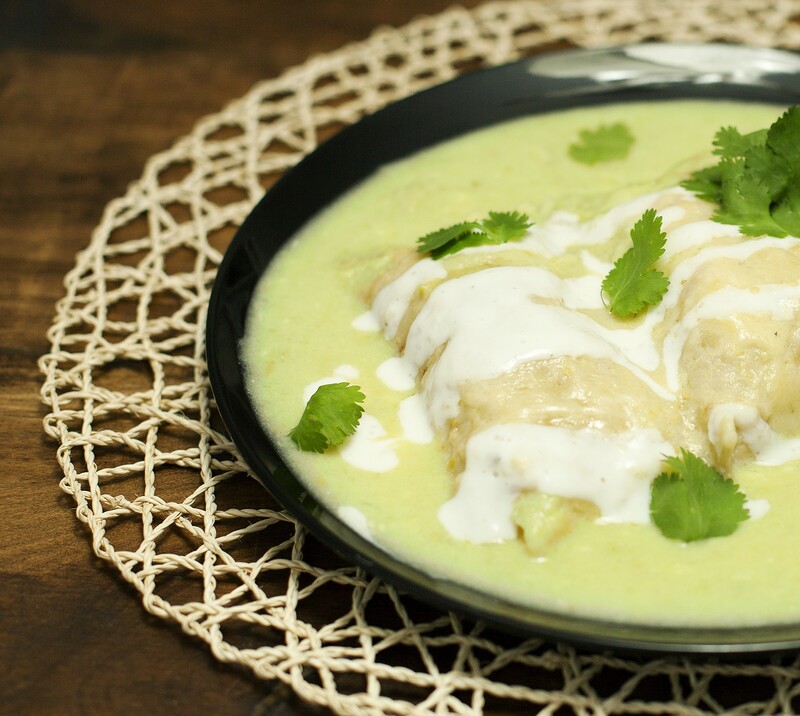 Serve three to a person, use all of the sauce available, and garnish with sour cream and coriander/cilantro. Note for the garnish I thinned out the sour cream with a little low fat milk. Handy Hint: I only used half the batch of the tortillas for the two of us and set the rest aside for another day. Yes, you did the math correct they were so unbelievably good we ate 1 1/2 servings like the little pigs we can be. I cooked all of the sauce in the oven and reserved the left overs for a tasty breakfast idea I have in mind. Adriene also directed me to Fiji Market in Newtown to get whatever spices I needed – amaaaazing! They’re famous for their on the spot spice mixers, have everything you could ever need and the store just smells incredible and the service is really friendly. Preheat oven to 130 degrees celsius. Gently heat the ghee in a cast iron casserole dish or something similar on the stove. The secret I’ve been told to making great curries is to sloooowly heat the spices in the original development. Gently fry the onions, garlic, ginger, curry leaves, cardamon pods, cinnamon, until soft and mushy. Stir the mix really well. Add the curry and paprika powders and ensure everything is mixed well. I added each tablespoon bit by bit. Toss in the salt and tomatoes and cook for about five minutes until everything looks pulpy-ish – the hard parts of the tomatoes won’t break down much until they go in the oven. Also place the dried chillies in now. Add the goat and stir well to combine all the ingredients. Cover and pop in the oven for about 2 hours, just keep an eye on it to make sure there is no burnage and if you start running out of liguid just add a little more water (and tomatoes if you have them). Cook the goat until it is tender. * The secret to a great creamy textured curry sauce via Adrian and her Indian friends: At the 1/2 way point, remove the casserole dish from the oven and spoon 3/4 of the sauce mix (not meat) out and pop into a blender. Process for about a minute until smooth and then pop back into the dish and back in the oven. In the last fives minutes of oven time take the dish out and add the Garam Masala. Pop back in the oven. Remove after five minutes and let the casserole dish cool for a further five minutes. Return casserole dish to a minimum heat on the stove and gently stir in the yoghurt. Don’t heat this too quickly or it will split :( This isn’t nice as you looks that creamy texture and quite simply your sauce will look like vomit – yuk. Sprinkle with the fresh coriander and serve with Basmati Rice and Pappadums. 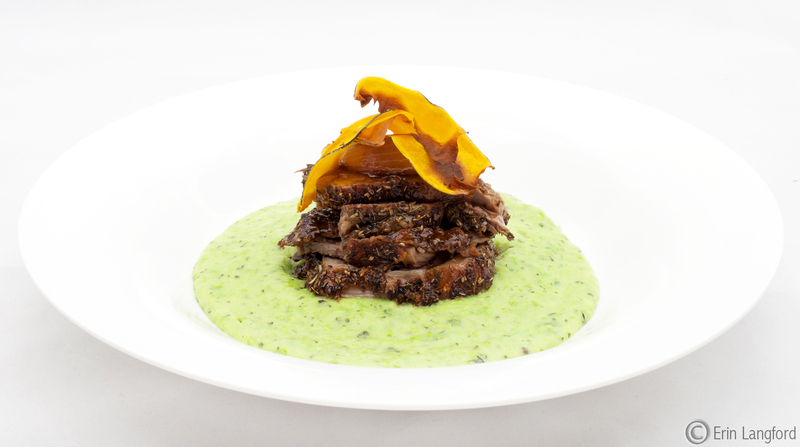 Fun Fact: Did you know that Goat is one of the leanest and most healthiest meat options available? Approximately 70% of the world’s population eats it, it’s just not very common in Western diets. The meat is very lean with hardly any fat (the fat that’s there can be cut off) and also contains more minerals and proteins than chicken. Plus it’s inexpensive too! "Sorry Tom. Mum's making Lamb Roast"
I love lamb. It’s been zonks since we’ve had roast so I thought I’d do something different with meat and three veg. The herby crust on this lamb is just so wonderful I could eat nothing else but a good girl eats her veggies too. Blast that oven to max capacity baby cause you want that little lamby crispy! Whilst the oven is heating up embrace Mr Whippy and grab a large plate and sprinkle it with the mixed dry herbs, salt and pepper then roll the lamb joint so it’s covered like a Sprinkle Soft-serve Ice cream. Then take a sharp knife and stab the meat all over and deep enough so you can shove in a little pieces of garlic, put in the garlic bits and drizzle with a little olive oil and pop in the oven (still on max) til brown and the herbs look crunchy (mine took 25 min). Monitor your roast though because if your meat is colder than mine when you put it in or a different weight/shape it may take less or more time, roasting meat proper I think is more to feel rather than exact time frames. When the outside looks crunchy/tasty turn down the heat to 180 degrees and continue to roast the meat. Add the onion pieces to the roasting tray as well, cook these for twenty minutes. Roast the lamb for approximately 30 minutes, your meat will be ready when you stab the meat and the juices run clear (angle your knife so you can see the contrast of colours easily as the juice escapes). Whilst the meat is roasting do all of your vegie prep, by the time the meat is ready to turn down you should be good to put your vegies on. Pop the potatoes on to boil and remove from the heat and drain once they’ve softened enough to mash. Add the butter, little salt and pepper and a splash of milk then mash. Heat the peas until just warmed through, drain and add the mint, the mashed potatoes and combine with a stick blender/processor til smooth (trust me the peas will not mash…I tried). For the pumpkin ribbons simply use your vegetable peeler and scrape down the edge of your pumpkin to get the pumpkin really thin. Then place on some baking paper and pop in the oven (whilst your meat is roasting) for only a couple of minutes. Keep an eye on the pumpkin it will colour quickly. Note use baking paper not foil, if you use foil you’ll have to spray with olive oil or the really thin pieces of pumpkin will stick – fail. Combine the gravy powder with a little cold water until dissolved then add the boiling water and bring to a simmer. Gently add your roasted onion chunks (omg yummo, have a piece for yourself before adding to the gravy…I did) and simmer for five minutes. So simple, great if you’re on a budget and really tasty, what’s not to love? 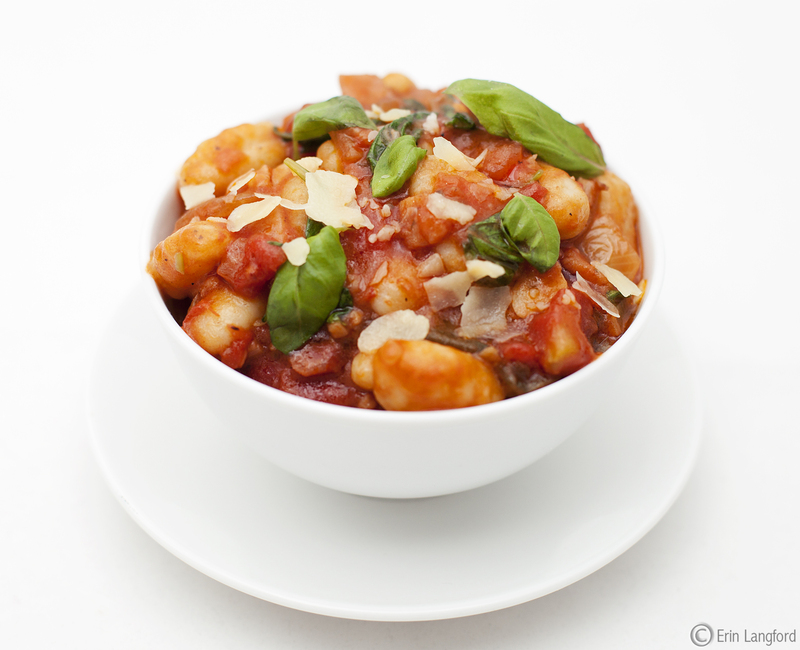 And if you’d love to make a Vegetarian Mediterranean style Gnocchi simply drop the bacon. This dish won’t take more then 15 minutes to prep and cook :) Note that this is not a recipe to make the actual Gnocchi ball things from scratch I’ll tackle that at a later date. 3 rashes of bacon, roughly chopped. Feel free to remove this if you don’t eat meat or pork, it’s really tasty either way. 500g Gluten Free Gnocchi, I love love love Simply Wise Gluten Free Gnocchi, tastes just like it should and cooks in like a minute!!! Only costs around $6, you’ll find it in the health food isle if you haven’t already tried it. Pop a pot of salted water on the stove and bring to the boil. Meanwhile saute off the onion, garlic and chilli flakes until tender then throw in the bacon and stir through. Next season the the tasty bits with salt and pepper and add the chargrilled veggies followed a minute later by the tin tomatoes. Gently simmer for about five minutes or so. Add the Gnocchi to the boiling water, won’t take longer than a minute to cook, the little bits of joy are ready when they float up to the surface. Strain the Gnocchi and toss through the sauce. Just before serving add the fresh herbs and combine. Garnish with some shaved parmesan and just munch out. Handy Hint: Use the oil from the chargrilled veggies instead, packed with flavour and your saving from your own oil stash. Lamb shanks, I don’t reckon I’ve ever had a baddie. And with the crispy cool weather we’ve had lately in ol’ Sydney I thought it’d be great to have a go at making some myself rather than heading to a pub. I got the recipe from the Taste site and the only changes I made was adding some green beans to the sauce at the end and serving on a bed of soft polenta. Also this sauce is enough if you cook four shanks instead of two, I had heaps of leftovers and plan on using the extra to braise some pork sausages in later in the week. Lightly coat the lamb shanks with flour, salt and pepper. Heat the oil in a large heavy-based casserole dish over a medium high heat. Add the shanks and cook until well browned on all sides. Then set the shanks aside whilst you get the sauce happening. Turn down the heat to medium and add the onion and garlic to the pan and cook until soft. Add the tomatoes, lemon rind, lemon juice and white wine to the pan. Stir until well combined. Return the shanks to the pan and bring to the boil. Add the thyme sprigs. Cover with a tight-fitting lid and place in oven. Bake for 1 hour. Check the sauce at the half way point to make sure that the oven hasn’t gobbled it all up, if it’s looking too depleted just add a little more water/stock for safety sake. Remove the casserole from the oven. Add the cannellini beans and stir until well combined. Cover and return to the oven for a further 20 minutes. Now in a medium sauce pan with the dry polenta and a little salt, whisk in the stock and keep stirring on a medium to low heat. Once the stock is mostly absorbed gradually add the hot water and keep whisking. This should take around 15/20 minutes or so depending on how quickly the polenta softens and absorbs the liquids. Take the casserole dish out and add the green beans, pop back in the oven for a further 10 minutes. Serve your tasty shanks on a bed of Polenta, spoon on heaps of the sauce and beans, don’t be shy. This is a really tasty little dish. It’s kinda like Italy meets Thailand I suppose in its fusion of flavours. I normally make this with either fresh salmon fillets or a 400g tin of salmon however I dumped the fish this time round, so its vege instead. Place your pot of water on the stove to boil and then add the fettucini, a little salt and some olive oil. Prepare as usual. Meanwhile in a large fry-pan heat some olive oil and saute the onions and garlic together until soft, then add the tomatoes, capsicum, lemon zest and eggplant cook on a low heat until they’re more tender. Then drizzle in the lemon juice. Crack some salt and pepper into the mix. Stir through the coconut milk and add the chillies and lime leaves and allow the flavours to infuse for a few minutes and then add the zucchini ribbons. Cook for another two minutes. Toss in the snow-peas into the sauce and check the seasoning and add more if required. Drain off your pasta. Combine everything in the pasta pot until all the fettucini is totes loved by the sauce and serve immediately. Handy Hint: If you love fish please add 2 fillets of finely sliced salmon or a large tinned salmon (if on a budget it works really well) after the coconut milk is added, the sauce takes on a whole new dimension. 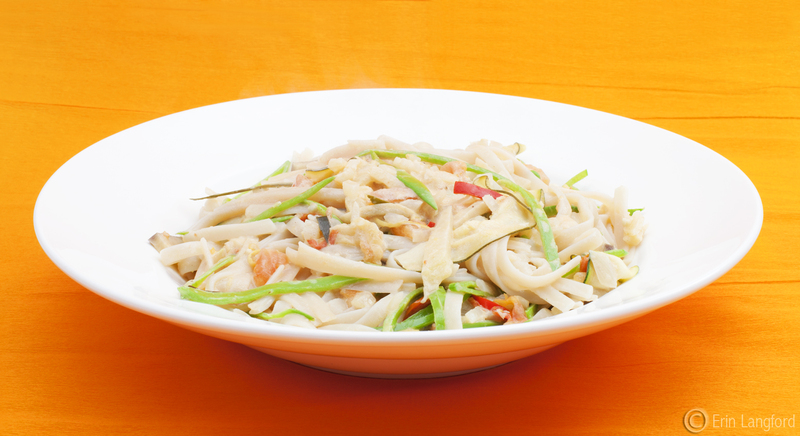 Don’t like seafood but want this dish with meat, finely sliced chicken breast would work best. A total experiment that I’ve been thinking about for and while and was so yummy the partner kept picking the fritta bits off the plate before I was able to serve lunch. Moist from the tuna, sweet from the corn and pops of crunch from the quinoa, quick and tasty, not to mention healthy. Cook Quinoa to packet instructions (Coles have their own brand and it’s not too shabby). Then place in the fridge to cool and dry out for 20 min. Combine everything except the Oil, Aioli and Salad in a bowl. Get your hands dirty and make little patties – for this recipe the mix hold better if you make them smaller and flatter (think more hamburger patty rather than rissole). Pop patties into fridge for at least one hour minimum. Nows the time to prep your salad. Heat oil in pan to shallow fry the Fritters. Gently add to pan, they’re a little temperamental so be gentle. Press down with your flipper. Cook until lightly browned and turn over. Be kind to them in the cook process and they’ll reward your tummy. Plate up with your favourite green salad combination and drizzle with a little Aioli. BTW the green bits on top in the photo are Chives. These aren’t necessary to flavour or experience I just wanted to use them up before I had to toss them. Place the chopped pumpkin, rosemary sprigs onto some baking paper and spray with olive oil and season with salt and pepper. In a corned of the tray add the pancetta. Pop into the oven to roast for about 15 to 20 minutes or until pumpkin is 3/4 cooked and the pancetta is crispy. Meanwhile prep the rest of the ingredients. Cook onions and garlic and roasted rosemary sprigs on a low-ish heat in a little olive oil for around five minutes until soft. Add the rice and coat with the onion juice for about a minute. Season with salt and pepper. Add one cup of the warm stock and mix through. Once the stock is absorbed add the next cup and the roasted pumpkin pieces. Use your spoon or spatula to break up some of the pumpkin pieces to help the flavour of the stock along. Check the seasoning and add more if you need to. Once that stock is absorbed add the third cup and the chicken slices, pieces by piece. Again wait til the stock is absorbed then add the final cup of liquid. The leaves from the rosemary springs should’ve dropped off by now, so remove the twigs. Five minutes before the rice is cooked through sprinkle in the shaved parmesan. Finally about a minute before serving add the butter and mix through. 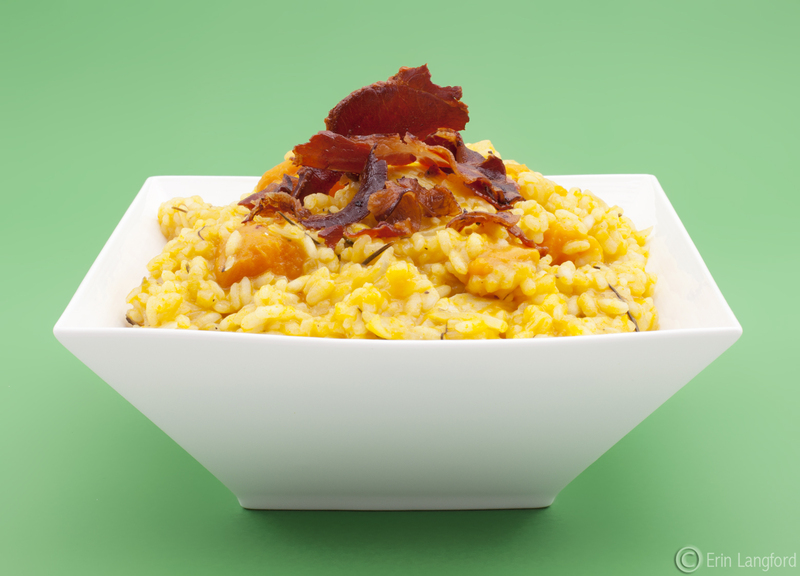 Serve in your favourite bowls (why use the ugly ones) and top with the crispy pancetta pieces. Handy Hint: If it looks as though your stock is absorbing too quickly turn down the heat and place a cover over the top to give the rice a chance to cook. Do keep an eye on it, you don’t want to stuff it up and stir occasionally to make sure it doesn’t catch on you pan bottom. Lazy A** Sunday Night Dinner! So I just couldn’t be bothered making food. Simple as that. I gathered whatever nommies were in the fridge and hey presto, Platter for Two. 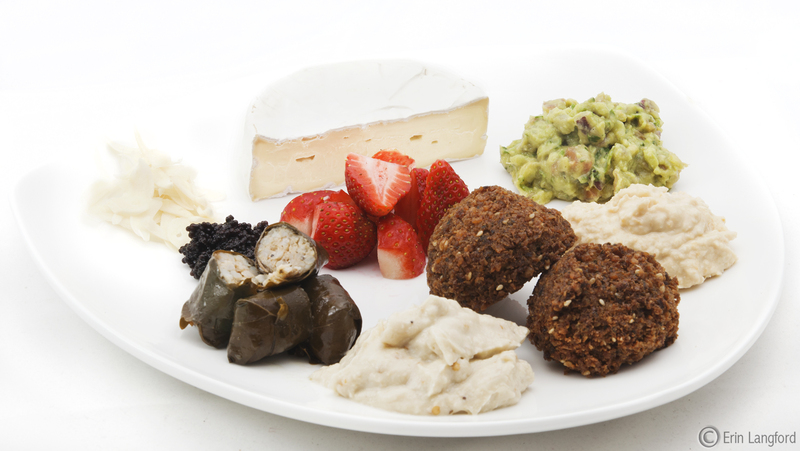 The great thing about doing a little platter like this for dinner is you get to use all the bits and bobs in the fridge and there’s no wastage. I remember as a kid my parents did something similar occasionally, we called it Snacks. It generally involved cubes of cheddar cheese, cabana, salami and gherkins with spring onions. What both dinners have in common is that they are served with crackers and everyone got to eat their favourite bits. Great idea if you have fussy kiddly-winks. To be frankly honest, it looks fabulous but I don’t think that I will make this particular Paella recipe again (I got it from Frank Camorra, Chef of Movida who shared his recipe on the SBS food site). Due to being on a budget I didn’t put all of the seafood ingredients in from the original recipe, but if this dish could’ve been anymore seafoody I don’t reckon I could’ve eaten it. I know it’s daft to call a Seafood Paella too seafoody. I did try to buy the freshest seafood from a local seller rather than a large chain grocer. I also used chicken stock instead of fish stock! This was a several hour labour of love and unfortunately it didn’t turn out as well as I had anticipated and I really believe that you should use a Paella Pan! Maybe borrow a friend’s if you don’t have your own, there’s a lot of stuff in here. Place the paella pan on low heat. Toast the saffron threads until aromatic and remove from pan. Now position the head of garlic in the centre of the pan and pour the oil over the garlic, spreading the oil a bit. Add the diced onions and stir briefly. Add the thyme and cook for the about 5 minutes. Add the red and green capsicum and season with salt. Stir briefly and cook for 10 minutes. Add the tomato and stir in, then cook for a few minutes more. Add the rice and stir for 2 minutes. Add the fish stock mixed with the tomato paste. Add the fish and peas. Place the prawns neatly on top and add the saffron stock mixture. Top with the mussels, simmer until the shells have opened, the seafood is cooked and the rice is tender. It’s a good idea to cover the paella with foil or a lid for the last 5 minutes of the cooking. Add plenty of chopped parsley and cover with one or two tea towels. Turn off the heat and rest the rice for 5 to 10 minutes. Paella is traditionally not served steaming hot. Who doesn’t love a creamy pasta sauce. I made this Rose sauce with bacon and cherry tomatoes. Yummo. All except the pasta. The pasta was disgusting and tasted like freakin cardboard, some strand were so bloody thick that I really had to bite through it. I used Riviera brand and I wouldn’t recommend it to anyone (I supplied a look so you can see the branding and know what not to buy). I would rather eat the San Remo GF range by far, their pastas may be on the thin side but they’re not too bad and nowhere near the same cost. On a medium heat cook the garlic and onion until softened, then add the bacon and cook for a further three minutes or so. Add half the cream and bring the heat down low, combine the flavours with the tomato paste. Now add the chicken slowly cook on a low heat, then add the rest of the cream once the chicken is cooked and stir through the pasta water. 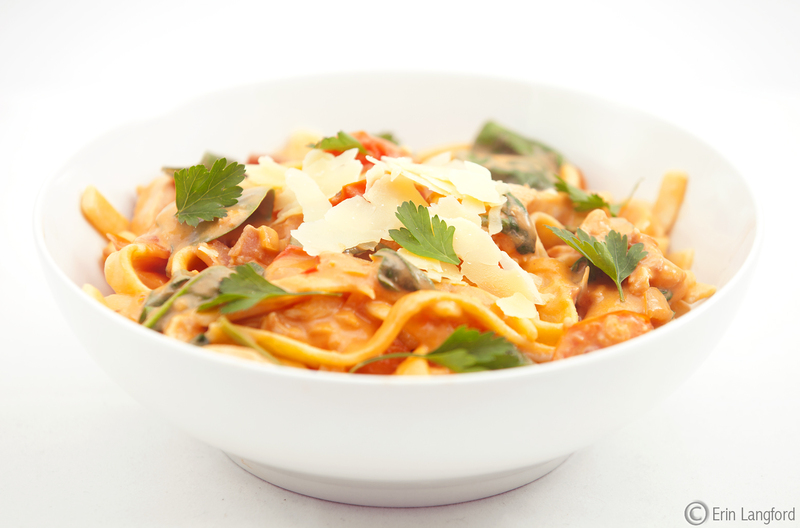 Four minutes before your pasta is ready add the cherry tomatoes and gently stir. Toss in the baby spinach leaves into the pasta sauce. Drain the pasta and combine everything (except parsley) in a large bowl. Check the seasoning and add a little salt or white pepper if required. Plate up the pasta dish and top with a little parmesan (or a lot if you love it) and make pretty with some parsley leaves. Handy Hint: You don’t need to add baby spinach leaves to a meal whilst the sauce is bubbling away, just add at the end of any dish and stir through a little. The heat from the dish will wilt the leaves pretty quickly which is why you always add just before serving. 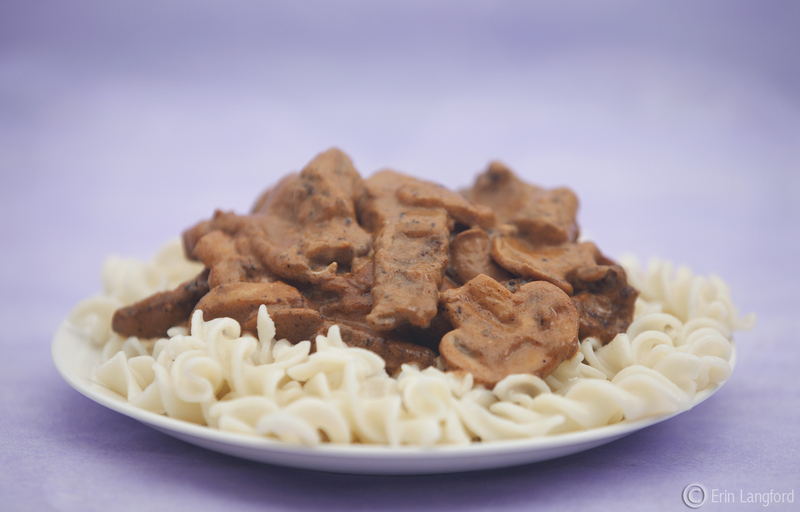 I have never made Stroganoff before and I thought it’d be a nice winter dish. Hunting through the net I came across Julie Goodwin’s version. 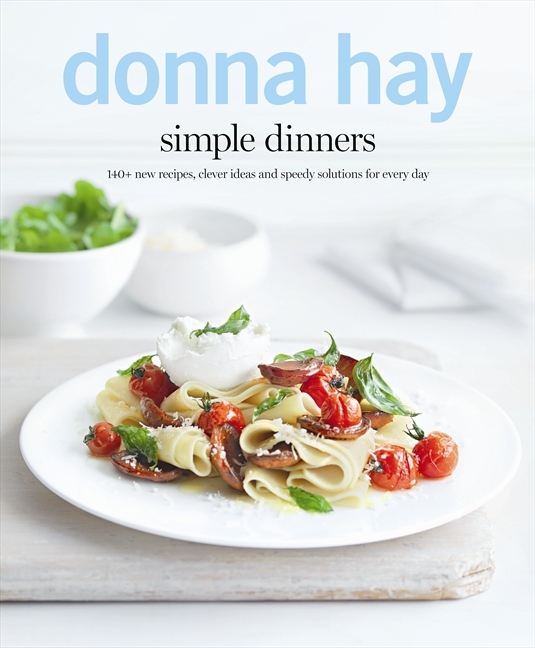 I thought why not she’s famous from Australia’s Masterchef for her amazing home style cooking. However I actually found the recipe to be flawed in the sense that is was rather bland and I was practically doubling the interesting ingredients to make the meal tasty. Pop on a large sauce pan of hot water on the stove with a little olive oil and salt, bring the water to the boil and toss in the fussili pasta. In a large bowl combine the flour, salt, pepper and paprika and add the beef strips, toss the flour mix to coat well. Bring a large non-stick fry pan up to a high heat, add a little olive oil and then cook the beef strips in batches, til golden brown. Rest the beef strips on a plate. Turn down the heat to medium and saute the mushrooms and garlic until tender. Add tomato paste and stir through. Cook for about a 1 minute further, then add the stock, worcestershire sauce and sour cream. Cook gently until warmed through and then return the beef. Mix the sauce until everything is well combined. Serve on a bed of pasta. Crispy Pork Belly with Honey Carrots...in your belly! I have been craving Pork Belly lately so why not just make it myself? Coles (one of Australia’s grocery stores) releases little recipe pamphlets for free on a regular basis and yes I am aware it’s just to buy their produce when you shop (even tho I got mine from a butcher and little fruit/veg store). Serves 2 okay more like 4 be we love this stuff! Preheat oven to 160 degrees (fan forced). Score the pork skin with a sharp knife, be careful the skin can be pretty tough. Rub in a couple of grinds of sea salt and a couple of splashes of olive oil. Place skin side down in a roasting pan and cook for 50 minutes. Raise the oven temperature to 210 degrees and turn the pork belly so the skin is facing upwards. Cook for 20 minutes and rest pork for 5 minutes. Now heat a little more olive oil in a large frying pan and cook the fennel and garlic for a few minutes on a high heat. Add the water and cover the fennel mix and simmer on a low heat until tender. Meanwhile pour beef stock into a small saucepan, bring to the boil and then reduce the heat to a simmer. To save space use a saucepan steamer on top of the stock pan and steam the carrots. Simmer stock for 10 mins, thus cooking carrots at the same time. Remove the stock and the carrots from the heat. Add the horseradish cream to the beef stock. In a small bowl combine the carrots, honey and parsley and black pepper. Thickly slice the pork and serve with the braised fennel, honey carrots and drizzle the lot with the beef and horseradish stock. I love a lot of things about France, and of course food goes with that statement. The last meal I ate in Paris was a Mustard Rabbit stew on a bed of fettucini – it was to die for! So to celebrate Bastille Day here with friends I thought I’d try to recreate something similar here in Sydney (about as far away from Paris as you can get :( ). However I couldn’t find rabbit anywhere, so I am using chicken instead. I found this recipe (that originally had rabbit legs) on the SBS site, they have wonderful recipes from all over the world. Instead of serving with Vegies, I am going to dish it up with some rice. Cook the rice and water in a microwave for about 20 minutes, then place on a plate in a fridge to cool. While the rice is taking care of itself in the microwave, chop the onion and quarter mushrooms. Season chicken with a little salt and pepper and dust with a little plain flour. Heat oil and butter on medium heat in an ovenproof casserole and brown chicken on both sides for a few minutes. Add chopped thyme, bacon, bay leaf, garlic and onion and stir well for 3-5 minutes. Add wine to dish and stir well. Then add mushrooms, stir well, cover with a lid and cook in preheated oven for about 30 minutes. Remove from oven and place casserole on top of the stove, on a very, very low heat. In a bowl, mix mustard with egg yolk and cream. Stir this little by little into the chicken sauce. The sauce must not boil. Keep it warm for 5 minutes for the mustard flavour to infuse the rabbit. Whilst the sauce is infusing with mustard, pop the rice, butter and parsley into a wok or large fry pan and heat through to separate the grains. Spoon a little sauce over the meat and sprinkle with parsley. 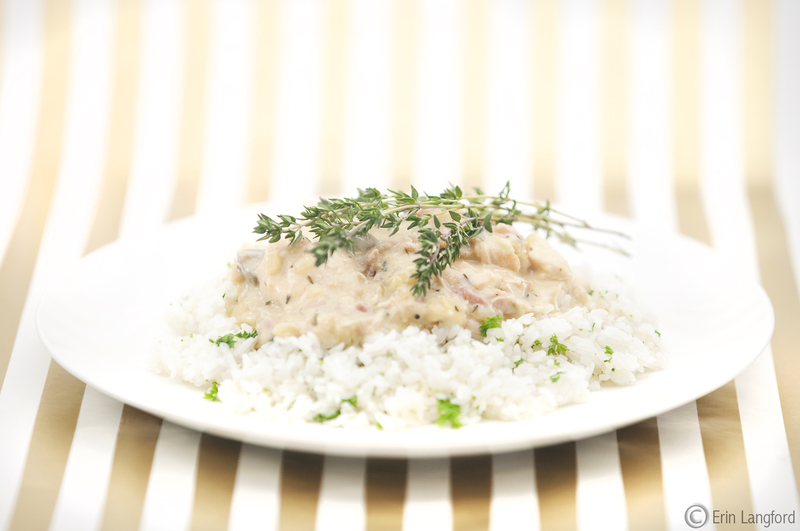 Serve on a bed of parsley rice. 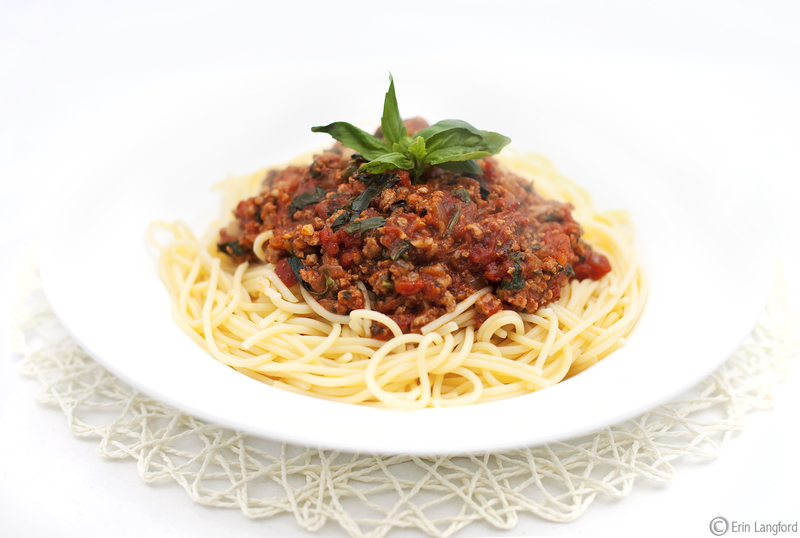 I really, really love Spaghetti Bolognese, just ask my Mum as a kid I used to eat multiple plates of it in one sitting. Now I just stick to one and a little bit more because it’s so good. I used pork mince this time round as pork and tomatoes go so well together, and it makes a lighter tasting sauce. However I generally use a lean beef mince. Either meat is great. In a large saucepan heat the olive oil and add the onion and garlic. Cook until they have softened and toss in the dried herbs and some salt and pepper. Stir through. Now add the pork mince and cook until the meat is completely cooked through. Add the sauces and cook for a further five minutes. Add the tomatoes and crush up further with your spoon in the saucepan. Stir through the tomato paste. Check seasoning and add more salt pepper if needed. Reduce the heat and gently simmer. While your sauce is simmering boil a large pot of water, and add the spaghetti. Five minutes from your spaghetti being cooked, add the basil and combine. Once the spaghetti is cooked through your sauce will be ready. While the pasta is draining, toss in the parsley. Serve the bolognese on a bed of pasta and top with shaved parmesan. I enjoy eating asian poached chicken, it tastes amazing and I know that it is really healthy too, so I decided to have a crack at making my own. Beware it takes a loooong time, we ate dinner quite late but I was committed to doing it right. Despite all of the ingredients the flavour is really light. I also invented my own tasty rice along they way. It would be a great side to things like Chicken Skewers, Chilli Wings and vegetarian options like sautéed veg. Okay all up this is going to take around three to four hours depending on how quick a chopper you are. Initially put the water and the stock ingredients (everything bar chicken) in a large stockpot on the stove. Bring to the boil and simmer for 15 minutes. Gently lower the chook, breast side down. Bring the temperature back up to simmer the chicken for another 15 minutes. Remove the pot from heat and let it rest for 2 3/4 hours. Half an hour before the stock is ready, cook your rice as per usual but add the ginger pieces and 1/2 the lemon juice. Once the rice is ready we are going to fry it off. So in a large frypan or wok drizzle in the sesame oil and gently heat. Once the pan is warm add the cooked rice. Use a spatula to combine the oil and rice and add the last bit of lemon juice. Keep tossing and turning the rice until the grains are separated. When you go to serve remove the ginger chunks. Finally remove the chicken from the stock and blanche the Baby Bok Choy (dunk in the baby bok choy in the stock pot). Cut off the chicken breast and slice. Use the rest of the chicken in another dish later in the week when you don’t feel like cooking too much. 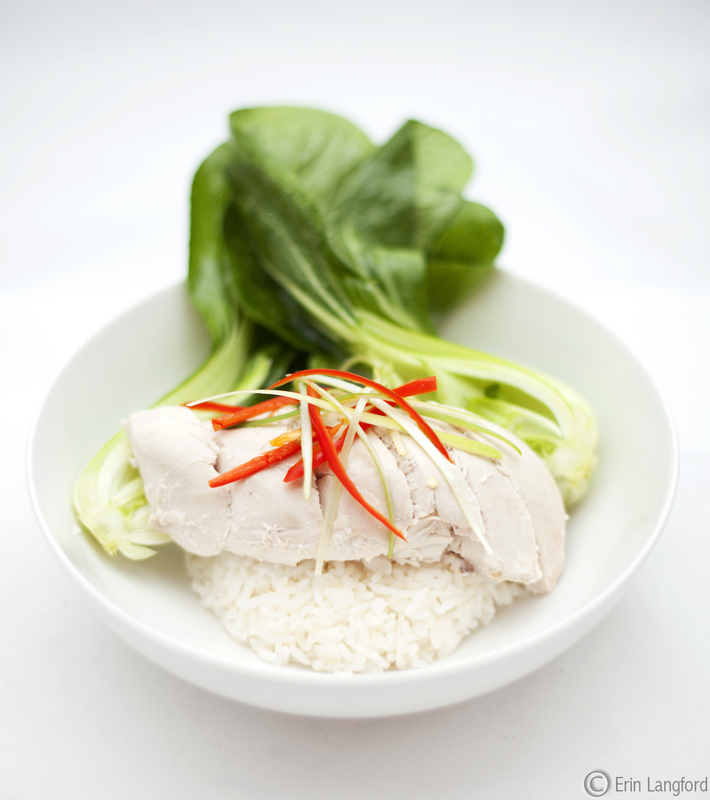 Serve the chicken with rice and baby bok choy. Garnish with eschalots and chilli. Another great garnish would be fried onions (available in the asian section of the grocery store) to really add texture to such a simple dish. Handy Hint: Don’t toss the stock – you’ve spent ages making it so reserve whatever your can fit in your freezer and keep for another soup or maybe an asian-y style risotto or paella. 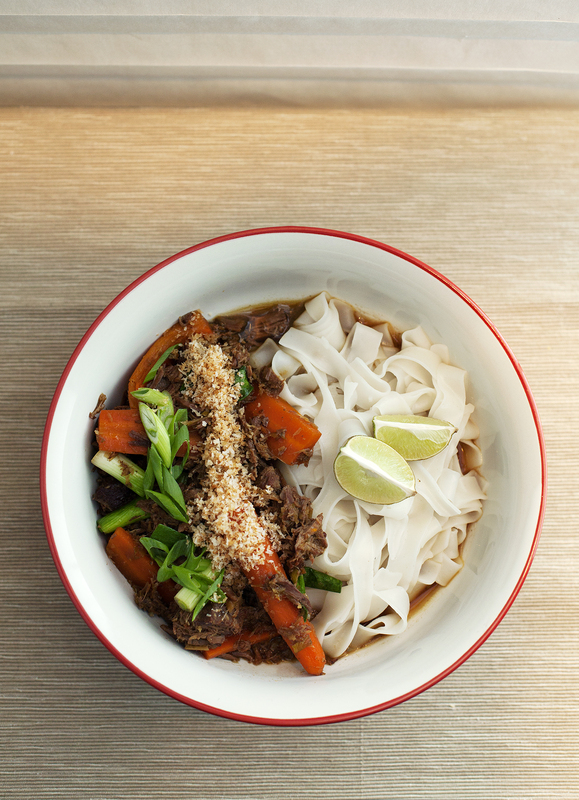 If you’re looking for a hearty gluten free meal – this is it. It’s easy, however it does need to cook for around 3.5 hours. But there is a lot you can do around the house or on the net whilst babysitting these babies. This recipe of mine feeds four polite people or two greedy guts. The Ingredients list makes it looks like a lot of work but it’s totes not. Everything is pretty much bunged together. In a fry pan on a high heat and one Chopped one large onion and 4 cloves of garlic. Seal the lamb chops. Once sealed add the chops, carmelised onions and garlic into a deep roasting tray. Pour the gravy mixture over the top til the chops are well and truly covered. If you need to add more water/gravy that’s fine you don’t need to be exact with this recipe it’s all by taste really. Just make sure to add a little more of everything else. Cook for approximately 3.5 hours, turning the chops every 45 mins. Chops are done when the bones fall away from the meat. Serve on a bed of creamy mashed potato and garnish with something green. Handy Hint: Massel are fantastic all of their Stocks and Gravies are Gluten Free so keep an eye out next time your looking for a pre-made stock. Three Munches for Fried Rice? Wait and see, you’ll never make it any other way again. I found Kylie Kwong’s Recipe on the ABC website, so Munchy I always have two serves. Also if you can’t find Chilli Jam anywhere, why not have a crack at making your own? I have tried a recipe that works beautifully, better than the gourmet jars I’ve found and way cheaper in the long run as you only need a tablespoon per 250g of meat. Find Chilli Jam Recipe here. 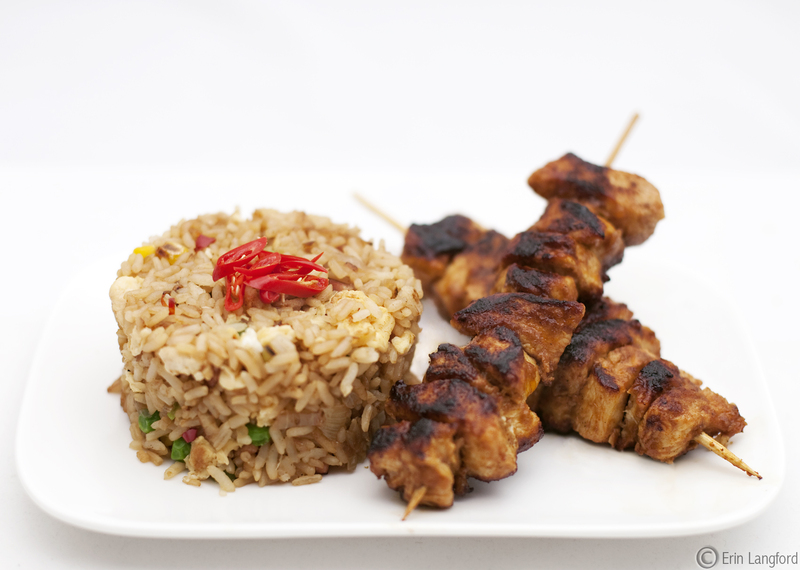 Chop the Chicken into large pieces and marinate in the Chilli Jam while you make the Fried Rice. Skewer when ready and Cook on a high heat. I found the best timing for adding the chicken to the pan is when you add the rice to the wok. 1/4 teaspoon sesame oil or a few more dashes if you’re like me and looove it. Wipe out wok with kitchen paper, add extra oil and stir-fry ginger, garlic and chillies until very aromatic. Add onion and stir-fry for 2 minutes, or until lightly browned and tender. Add bacon and stir-fry for a further minute, or until lightly browned. Stir in sugar and wine, then stir-fry for 30 seconds. Finally, add cooked rice, reserved omelette, oyster sauce, spring onions, and sesame oil. Stir-fry for 3 minutes, or until rice is heated through. Roughly chop omelette into smaller pieces as you stir. Plate up and garnish with extra spring onions. I used Chilli as I actually ran out of spring onions or thought I did until I moved something in the fridge the next day and found another bunch. Handy Hint: Cook the Rice first and than pile onto a large plate and spread it our (to create larger surface area) and pop into the freezer to help dry it out. Once you’ve prepped and chopped everything the rice should be okay to use at the add cooked rice stage. 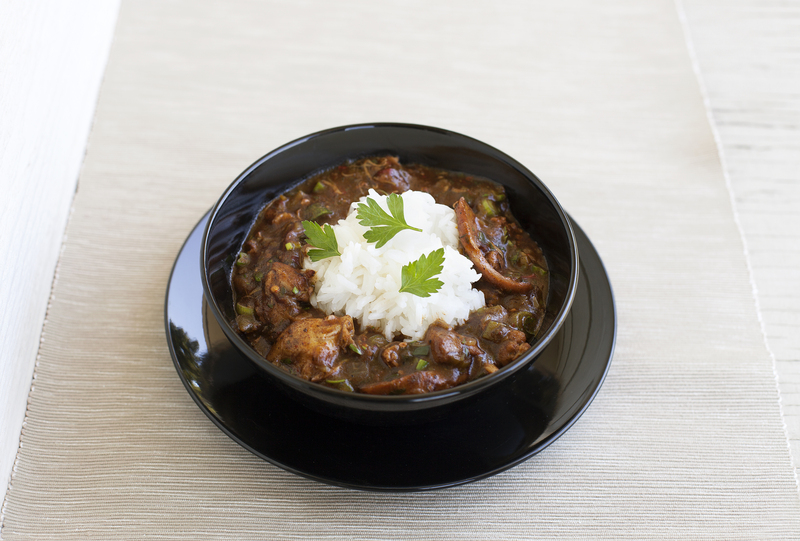 This is great if you’ve forgotten to cook the rice earlier in the day or the night before. Dry cooked rice (as opposed to wet or maybe gluggy) means a more lighter, separated fried rice. 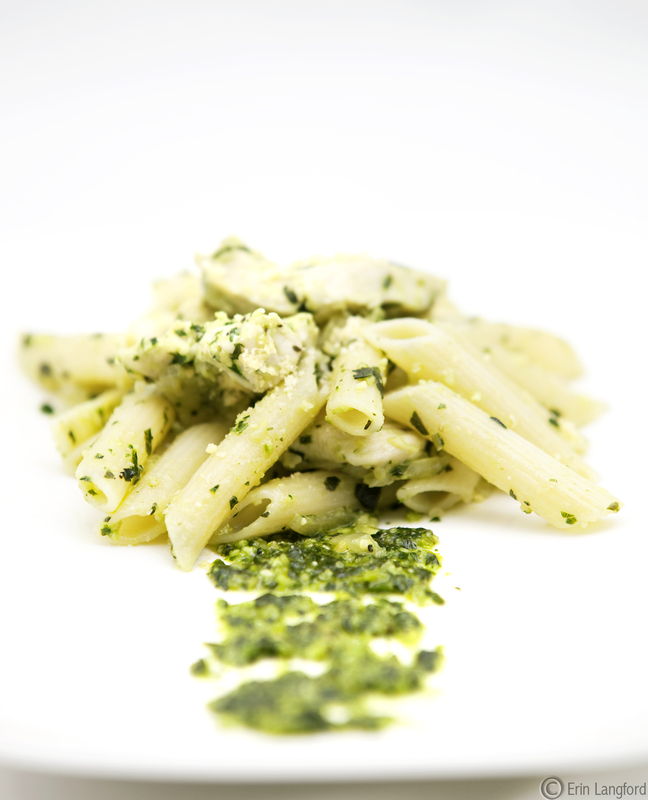 Everyone loves a simple pasta dish and what could be more easier than making your own Pesto. I used Orgran Gluten Free Multigrain Quinoa Penne. It really holds it’s spring and shape unlike most other Penne available in supermarkets. 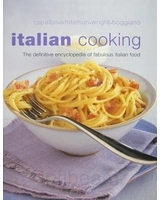 I sourced my Recipe from Italian Cooking, The definitive encyclopaedia of fabulous Italian food. I came across this book in a sale years ago. I didn’t add the cheese as it suggested though. Boil of Pot of Water and add Pasta. Cook until Al Dente. Reserve a little of the pasta water for later. In a blender add the Basil leaves, EVO, Pine nuts and salt and pepper process until smooth. Only takes about two minutes to make the pesto. In a medium saucepan saute the onion until translucent, then add two tsps of your fresh pesto and heat through. Finally, the chicken breast, cook this on a medium heat until ready. Toss the Pasta, and Basil Pesto Chicken mix together in a large bowl with a pair of tongs to make things easier on yourself. Add another teaspoon of pesto per person and coat the Pasta. If your pasta is still a little dry, use a little of the starchy water to help glisten the dish. Add the extra torn basil leaves. Check the seasoning and add a little more salt/pepper/pesto if needed. Plate up and garnish with Parmesan Cheese. Handy Hint: My friend Carly’s Mum likes to freeze the remaining fresh Pesto in ice-cube trays for later use. Pesto makes a great base for Pizzas or use it on your Toast like I do when you make a Breakfast Bruschetta.